With a voice and story resonating a thunderous soul & a drive to change the world, Stella Blue carries with her a talent not to be ignored. Having come from a humble countryside farm in the hills of Missouri, Stella Blue set out to see the world & took to traveling at as a teenager to find her place and purpose in this life. Stella first became enamoured with guitar while observing the street musicians on Ocean Beach in San Dieago, California. Stella, at the age of 18 finally got her first guitar and taught herself to play. Songwriting came naturally to her as she belted out hundreds of songs over the next few years. In 2004 stella was recruited into the group "Wooden Ships" and found the stage for the first time. Rapidly becoming polular in the midwest, Stella started her first band, "The Stella Blue BAnd" and began touring in 2005. Over the next two years Stella Blue toured and played with such acts as "Jim Dandy's Black Oak Arkansas", "Andy Tanas of Krokus", and The Zak Perry Band. 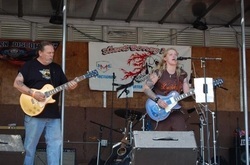 In 2007 Stella Blue fled her home base of Cape Girardeau, Mo due to a violent, attack after coming home from playing "TheTommy Bolin Fest" in Sioux City, IOwa. Little did she know that this was to be the blessing that would bring her to new heights.